Q. What will one of these systems end up costing me? A. If you’ve got 10 or fewer employees, $529 for the Extreme Blue Starter Kit or $849 for the Extreme Blue Enhanced Starter Kit. (What's the difference between the systems? Click here to find out.) That’s it—plus shipping, of course, and if you're in Illinois, you'll have to pay sales tax. There are no monthly or annual fees to use the system. You get 30 days of free telephone or e-mail support when you buy the system; that should be plenty to get up and running. If you feel you need more help, a one-year annual support agreement is $149, but it’s completely optional. If you have more than 10 employees now or in the future, all you need is more iButtons—you can get 10 for $59, with discounts for larger quantities. Each clock can handle as many as 2,000 employees. Q. I've been using your older version—TimePilot Extreme—for a few years. Now I want to add a few more clocks. Can I add Extreme Blue clocks to my Extreme system? The same way you use your older Extreme clocks—retrieving the data with your USB drive. This works with any version of our software. Retrieving the data from the new Extreme Blue clocks via Bluetooth using the free smartphone app and the data from the older Extreme clocks with your USB drive. You'll need the Enterprise version of our software to get the data from the phone to the software. If you're using another version of our software, you can upgrade to Enterprise here. You don't have to make a permanent choice; you can collect the data with a USB drive one week and with the smartphone app the next. Q. I have 35 employees. How many iButtons will I need for them? A. 35—one for each employee. That's how all TimePilot systems work: one employee, one iButton. (But you might want to order a few extra iButtons as replacements in case an employee loses one.) If	an employee leaves the company, you can reassign their iButton to another employee. TimePilot iButtons carry a lifetime warranty: If one ever stops working, return it to us for a free replacement. If you purchase an Extreme Blue or Extreme Blue Enhanced system, you can order more iButtons at checkout. What's an iButton? Here's an explanation. Q. How do I get the data from the clock to my phone? A. Among the items in the Starter Kit is a special gray iButton called the Management iButton. When a supervisor taps this iButton to the clock, the clock knows this person has authorization to download the data and starts emitting a Bluetooth wireless signal. Then the supervisor taps an icon on their smartphone, enabling the phone to receive the signal. The clock and the phone establish a connection and the data is downloaded to the phone. By the way, the latest 12,000 clock-ins and clock-outs always remain in the clock's memory, so if you lose your phone, you can recover the data. Q. Do I need a data plan with my cell phone account? A. If you have Extreme Blue, it's optional. (Having one will allow you to back up your TimePilot data by sending the data to a cloud service like Dropbox.) If you have Extreme Blue Enhanced, yes, you'll need a data plan, but if you have an iPhone or Android phone, you probably already have one. The data collected by the TimePilot app has a very small file size, so there's probably no need to add extra gigabytes to your data plan. Q. I have several locations. If I mount a clock at each one, can my employees clock in or out at any of them? A. Yes—as long as the data from all clocks is downloaded into the same phone (for Extreme Blue) or the same database at headquarters (for Extreme Blue Enhanced). By the way, once you've purchased an Extreme Blue Starter Kit, extra clocks are available at $449 for one, $848 for two and $1,237 for three. Each extra clock comes with a mounting plate and padlock. Q. If my Extreme Blue Enhanced system consists of several clocks and they all download into the same database, can I tell in the TimePilot Central software which clock an employee clocked in or out at? A. Yes. You can name each clock in the TimePilot iPhone or Android Apps. From that point onward, each clock-in or clock-out carries with it the name of the clock where the clock-in or clock-out occurred and that information can be viewed in the TimePilot Central software. Q. If it’s designed to be left outdoors, how do you keep it from being stolen? A. Each Extreme Blue clock comes with a steel mounting plate that screws to a wall or other flat surface. The clock hooks onto the mounting plate (covering the screws) and is secured with a padlock. The padlock has a hardened steel shackle that's 5/16 of an inch in diameter. 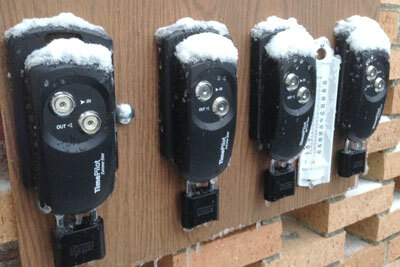 During testing, four Extreme Blue clocks endure an early-winter snowfall. Click the photo to see a larger version. Q. How weatherproof is it? A. We don't recommend using it underwater or mounting it under a downspout, but it should be fine in rain, snow, sleet, hot or cold weather. (See the photo at right!) In testing, they've worked flawlessly in 25 F. below zero (-31.7C) temperatures. Q. How long will the batteries last? A. Our testing indicates the 4 AA batteries will last for at least a year. Q. Do I need to reset the clock when we change to Daylight Time or Standard Time? A. No. Each time you assign an iButton to an employee or collect data from your clock, the time and date is updated on that clock using the time and date on your phone. In a pinch, you can also change it in the app. Q. I need a timeclock for the shop too. Do I need an Extreme Blue for that? A. Probably not. Another of our timeclock systems, TimePilot Vetro, is probably a good solution. It's designed to run indoors and uses the same iButtons Extreme does, so employees only need their one iButton. Other possibilities are our pocket-sized portable clock, TimePilot Tap+ and our software-only clock, TimePilot PC. All TimePilot timeclock systems are designed to work together, so you can create a system that, for instance, has Extreme Blue clocks at the job sites, Taps in the trucks, Vetro in the shop and TimePilot PC at your office workers' PCs. Q. Will the TimePilot software run on my computer? A. If you have a Windows machine, almost certainly. Our software will run on all versions of Windows 10, Windows 8 Windows 7, or Windows Vista, as well as Windows 2012 Server or Windows 2008 Server. Q. Will the software run on an Apple Mac? A. Possibly—if you're running Windows on your Mac with the help of Parallels or VMware Fusion. We've run a few tests on MacBook Pros using Parallels and VMWare Fusion, and the systems seem to work. We can't guarantee it because we are a Windows-focused company and just don't have the deep Mac knowledge to give you support if you have a problem. However, we offer a 30-day return policy if you want to give it a shot. Do you have more questions? Just ask!